Welcome to Day #2 of Chocolate and Starches Theme Week. 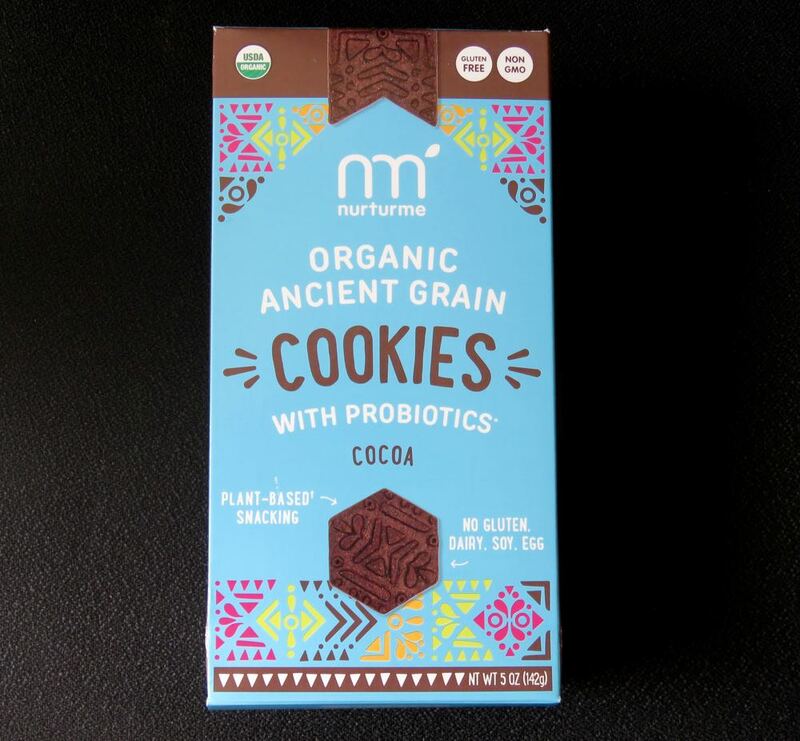 Today's NurturMe Organic Ancient Grain Cookies - Cocoa - were manufactured for Freed Foods (Austin, TX), and were made from a flour blend of millet, sorghum and quinoa—considered "ancient grains" here (as well as potato and tapioca starch). Quinoa is a plant from the Andes with starchy seeds that looks like a grain. 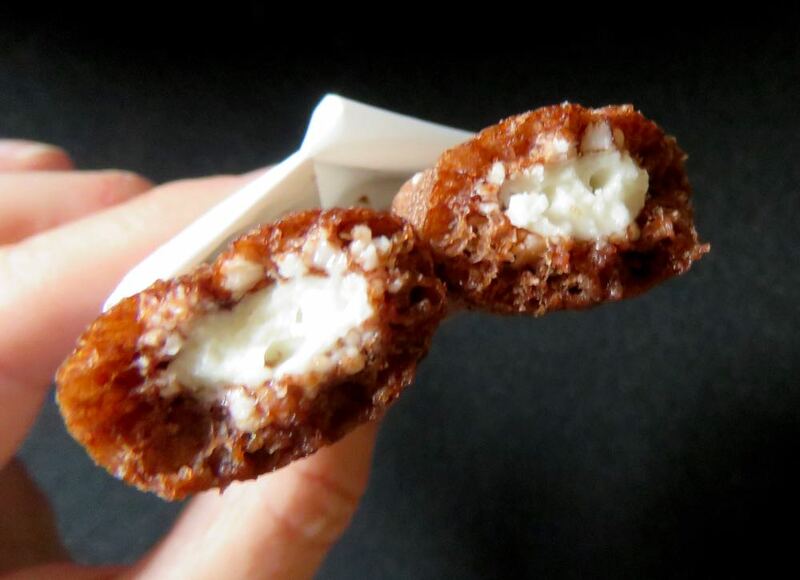 Technically it's a pseudo-cereal, that has become popular in the U.S. in recent decades. 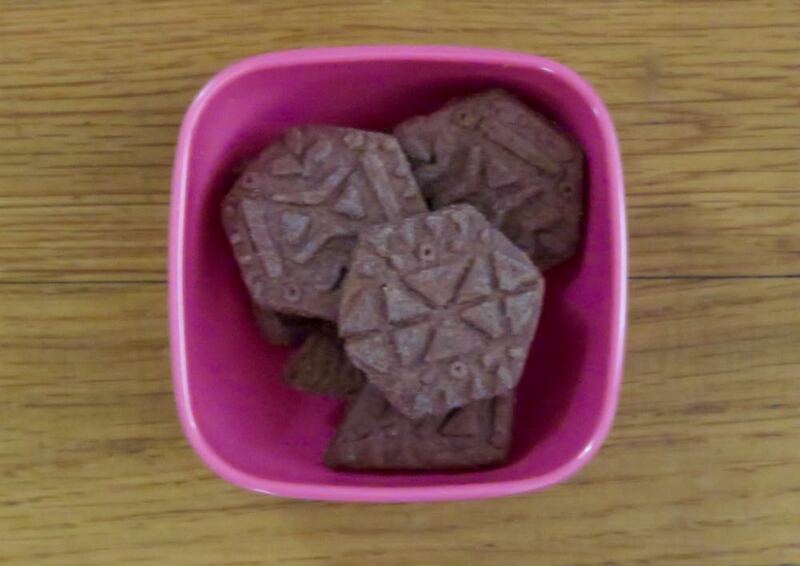 Today's small cocoa-flavored cookies were crunchy, and not too sweet (thank you). Quinoa can add a satisfying crunchy texture to baked goods, especially cookies. The cocoa gave these cookies a rich flavor. These were a bit on the dry side, but it was nothing a glass of water, milk, coffee, or companion beverage of your choice wouldn't be able to address. 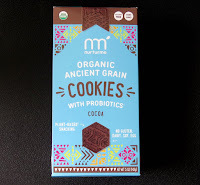 Did I mention these cookies included probiotics? The probiotic(s) listed: GanedenBC30(R) (Organic Inulin, Bacillus coagulans GBI-30 6086). Sounds technical. We weren't sure what this beneficial bacteria is used for in terms of digestive or overall health. But, it didn't seem to affect the taste of these small cookies. Welcome to Day #1 of Chocolate, Grasses and Grains Theme Week. 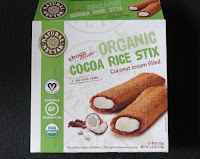 Today's ChocoDream - Organic Cocoa Rice Stix - Coconut cream filled packaged snacks were made in Italy and distributed by Natural Nectar (Huntington, NY). 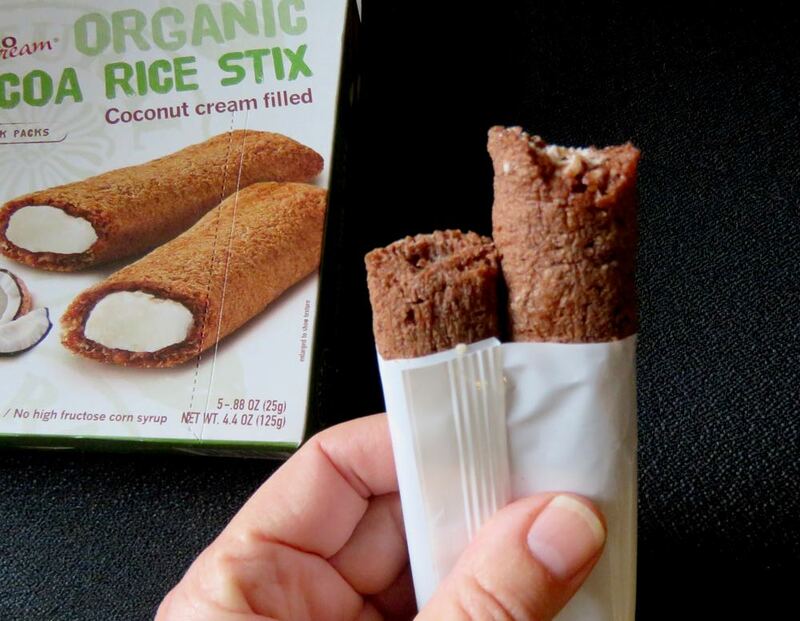 Why incorporate starch from rice, corn, millet, quinoa, oats, grains, pseudo-cereals, and other grains and root vegetables into a chocolate item? Chocolate can certainly perk up grains. And starches and grains can add crispy texture, e.g. to an oatmeal or quinoa chocolate chip cookie, or to today's organic crunchy rice treats. Chocolate purists may not agree, but this week we're sampling chocolates with a bit of starch added. Today's box* of light, sweet, crunchy cocoa flavored** tube-shaped sticks were filled with creamy coconut resulted in an addictive combination—as tasty as any cookie out there (if you like a bit of coconut). And they were gluten free, vegan and organic. *This box of 5 individually-wrapped packets contained two pieces in each packet. 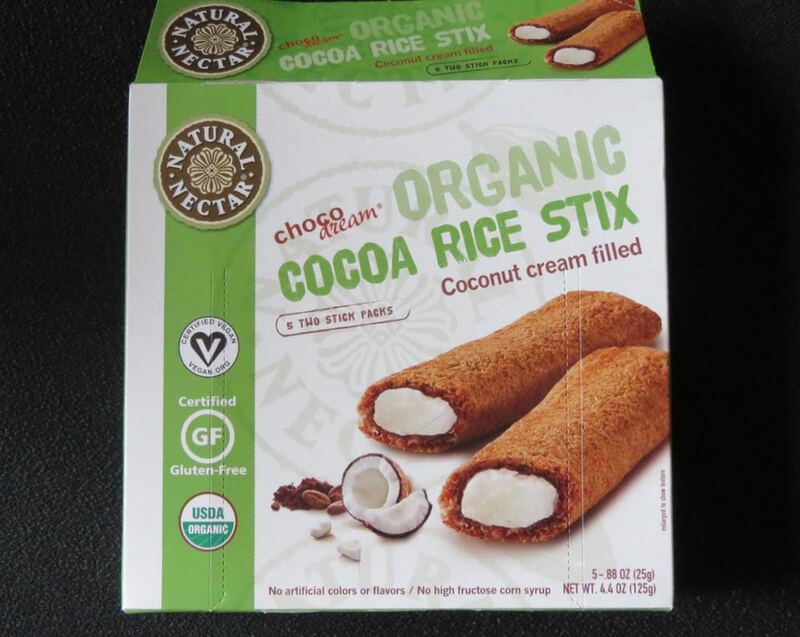 **Ingredients: organic cane sugar, organic rice flour, organic grated coconut, organic sunflower oil, organic coconut oil, organic low-fat cocoa powder, organic quinoa flour, organic millet flour, salt.